Pictured: Raquel Welch puts on the dog to attend the World Premiere of her own "1,000,000" hit: ONE MILLION YEARS B.C. (1966). What a week: it's been the best of times and the worst of times. Let's start with the worst. I hate snow and we're snowed in, with more freezing rain in the immediate forecast; I'm burned out from preparing two issues of VW faster than should be humanly possible; we're trying to adjust our cats to a new diet and they're hounding us for food all the time; and our widescreen TV has picked the week before the Oscars telecast as a peachy time to die. Fortunately, its replacement is already here, but it has been standing for days, in a box the size of a drive-in screen, in the middle of our living room floor, making the only room in our house suitable for waking relaxation no longer very fit for such, and we can't get anyone out here to unpack and mount it to our entertainment system for us until "maybe next Tuesday"... but, on the other hand, what a great week for accomplishments this has been. "I never was much of a computer guy, and only discovered the blog when the Bava book was almost out. I've grown so addicted to it that I'm going back and reading the earlier blogs, one at a time, savoring each like a fine wine. I won't go into how many wonderful things I've discovered, how many amazing people I've grown to know, and how many awesome books and DVDs I've discovered through the blog. The main reason I read it, along with finding out which version of whatever DVD is best to get, is to get to know you personally in a way that I'll never be able to in real life. I just finished reading your fantastic blog on Sterling Hayden from 3/2006, and your 'About Friday's Blog' blog, which is hilarious. All I can say is, your blogs are a treasure... If you ever collect the blogs into a book, I'll be the first to order a copy." Well, John, thank you, and we hope to do just that -- the problem is finding the time to do it. I've always resisted this because I'm a writer rather than a layout artist, but I may have to get Donna to teach me how to do what she does on PageMaker, so that I can start moving ahead with selecting material and pouring text into new page templates in my spare time (such as it is), while she's laying out the magazine. In addition to collecting the blog in book form, I also intend to start collecting my archival writings in book form, too. It remains to be seen how much of this we can actually manage, while also maintaining our monthly schedule and other tasks; after all, we had also hoped to organize some merchandising items to tie in with the Bava book, but again, not enough hours in the day, not enough man power, and we can't afford to hire (nor do we really want) employees to help out. I guess we value our privacy even more than our productivity. What's that? I didn't previously mention the Portuguese publication? That's right, I didn't -- it's been a busy week, with work now already nearly done on VW #138. But to fill you in: some months ago, I was approached by Eugenio Puppo to contribute an essay to a book that was being published in conjunction with the Brazilian Ministerio da Cultura and the Centro Cultural Banco do Brasil to celebrate the works of José Mojica Marins (Zé do Caixao). 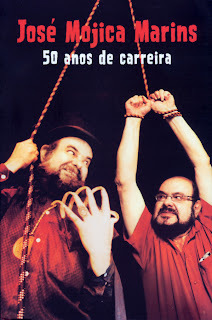 The resulting book, JOSE MOJICA MARINS: 50 ANOS DE CARREIRA, edited by Eugenio Puppo, is a handsome 176-page paperback composed of interviews, reviews, essays and various appendices, with rare stills on nearly every spread. My essay, which occupies two pages in print, is called "Zé do Caixao: O Pesadelo que deve Sobrevivier" ("Zé do Caixao: The Nightmare That Must Survive") and was translated into Portuguese by Ricardo Lisias. The book's ISBN number is 978-85-98404-02-8, but, beyond that information, I really couldn't tell you how to locate a copy. Since there has been no English publication of my essay, I'll post it here in the days ahead. The issue-after-next of VIDEO WATCHDOG, incidentally, #138, will feature a wonderful Round Table Discussion of the AIP Edgar Allan Poe series by (get this line-up) Roger Corman, Daniel Haller (art director of the series), and Joe Dante, moderated by Lawrence French. Larry's new book, VISIONS OF DEATH, is out now from Gauntlet Press and collects Richard Matheson's original scripts for THE HOUSE OF USHER and PIT AND THE PENDULUM, along with outstanding production articles and a new interview with Matheson. Corman has told his Poe stories many times over the years, even in audio commentary form, but this RTD is remarkable in that the presence of Dante, and Haller in particular, spurs him on to tell numerous stories and go into candid details I've never heard or read before, and Haller has rarely been interviewed. I'm excited about presenting this issue... but before I can do that, I have to proofread it, so here I go. But first, I want to thank you all for being there for Video WatchBlog -- every day, for a lot of you. Those seven digits are numbers you helped to accumulate, so this milestone is yours, as well as mine. In case I haven't said so before, the best part of writing Video WatchBlog is knowing there are Video WatchBlog readers.